When it came out in 2011, Mario Kart 7 had most of what the fans wanted in a Mario Kart game. It had some great new tracks, like Shy Guy Bazaar, Melody Motorway and Rosalina’s Ice World. It had the best set of returning tracks in the series, including such gems as Waluigi Pinball, Airship Fortress and Maple Treeway. And well, it was the one game that introduced tons of great new characters too. Like Shy Guy, Lakitu and Wiggler. However, it also had one small issue. Namely… Waluigi wasn’t it. It managed to have Queen Bee from Super Mario Galaxy sure, but Waluigi? Nah, guess Nintendo and Retro never thought of putting him in the game. What’s more, it’s a really well-done mod too. All the animations work well, all the icons have been changed, his voice clips are identical to the ones in other Mario spinoffs… Indeed, if I didn’t know this was a mod, I’d actually think it was an official bit of DLC. Seriously, it really does look that professional. 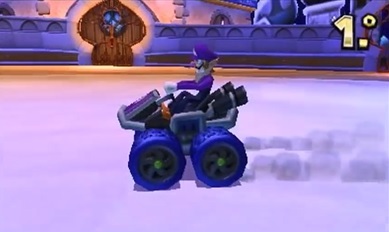 So, if you’re a fan of Waluigi (or just want to see Mario Kart 7’s roster fixed up), check it out. It’s a nice fan made character mod that replaces Honey Queen with Waluigi and basically does exactly what fans have wanted the game to do from the very beginning. Thanks for making it PabloMK7!